Michael Martone is the author of five books of short fiction including Seeing Eye published in September of 1995 by Zoland Books, as well as Penses: The Thoughts of Dan Quayle (Broad Ripple Press, 1994), Fort Wayne Is Seventh on Hitler's List (Indiana University Press, 1990), Safety Patrol (The Johns Hopkins University Press, 1988), and Alive and Dead in Indiana(Alfred A. Knopf, 1984). He has edited two collections of essays about the Midwest: A Place of Sense: Essays in Search of the Midwest and Townships: Pieces of the Midwest (University of Iowa Press, 1988 and 1992). He edits Story County Books, and his newest book, The Flatness and Other Landscapes (University of Georgia Press, 2000), a collection of his own essays about the Midwest, won the AWP Prize for Creative Nonfiction in 1998. 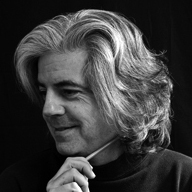 Nonfiction Editor Liz Anderson conducted this interview with Michael Martone. Liz Anderson: Your adept craft of writing false biographies is both mysterious and original. Where did you get this idea and how has it strengthened your writing over the years? Michael Martone: You are very kind to say so. Thanks. You are speaking of the monologues I write using characters off-the-shelf as I call them. Alfred Kinsey, James Dean's high school English teacher, Mark Spitz, etc. I think I must trace all of this back to the oddity that I was born and grew up in the same town as Edith Hamilton, he great popularizer of Greek Mythology. I think of those biographies as initial attempts to record a modern mythology for my hometown and state . Down the road was the little gray book of monologues, Pensees: The Thoughts of Dan Quayle, a book that takes its cue from Mao's Little Red Book. The first person is an interesting form. You ask how it has strengthened my writing. Well, the form itself is about that, I think. The drama is not in what the character tells but how the character tells. And what happens, if you do it right, is that the character in telling and while telling actually learns how to tell. That is to say, the dramatic arc of the monologue is that the character figures out the story as the story is being told. LA: Your work is often compared to John Barth, a former professor of yours. What was the best advice that he gave you? What did you learn from him that you teach your own students today? MM: Best advice? He told me I didn't write stories. He meant that technically-what I wrote was not “narrative” fiction. But then said that I was still writing something interesting that we would call, after Borges, “fictions.” This was incredibly liberating. This allowed me to think that I was in control, in a way, of my own work. I did not sit down to attempt to write the ideal story-do everything right to get to the target. No, instead, he taught me that every time I sat down I was inventing not just new content but also the form it came in. What I learned from him and pass on to my students is that-that the house of fiction has many windows, and this: a writer writes. For me it makes no difference if a story is a good or a bad story. Or if it is a Best American Story. What I want to be able to teach are methods and techniques that will sustain writing as a practice in and for my students. Twenty years from now, if a student tells me she or he is still writing, I will mark that as a good outcome. LA: How has your position as the current Director of the Creative Writing Program at the University of Alabama influenced your writing? What is the most valuable advice you have ever been given from a student? MM: Not directing currently. We take turns here doing that. But I have directed. I think directing deconstructs the idea of the act of writing as a solitary act-the Romantic/Modernist idea that authorship is individual genius. Instead I think it exposes the collaborative nature of the task in many interesting ways. Advice? I like to think that I teach in a kind of Montessori way. I don't give advice to the student. I like to ask each of them what it is she or he wants to do and then I try to help each one to get to that. So in a way all of my students are constantly advising me about what I should be doing. And I am always willing to try to follow them where they want to go with their work. LA: I have read that you have had some very unique book readings-even that you have asked the audience to leave their cell phones on and include you in their texts. This laid-back quality is surely an asset in your line of work! How do you teach your own students to live outside of the box? MM: If I were as good as the kids today, I would be able to text back while I was reading. How do I teach them to live outside the box? I don't teach. Well not in the usual sense because teaching teaches the box doesn't it? We used to call teaching schools “normal” schools. That is because we think and act as if teaching is “norming.” The teacher so often is policing standards, attempting to get a student-who is thought to know nothing-to passively ingest the knowledge. So I don't teach anything (if you accept that model) but I hope to create interesting environments in which the student will do things they want to do. “Control” means to “roll against.” My idea is to roll with. Students who come into my classroom do so saying they want to write so I let them write. I have no interest and don't even see it as my business to get them to write or create art in the way I think they should. I roll with. In my undergrad classroom this fall, I said, first thing, get out your cell phones. And they said, yeah we know turn them off. I said, no, get them out and write. But before I even finished the sentence they were already texting. I like to go with what the students already want to do. Now many people would say that what they are writing is crap-I'd contest it but anyway-and let's say that is so. But so? They are writing. There are a lot of people out there who feel compelled to say this is worthless and to scold them into doing “better” work. I just don't waste my energy on the task. I am not in the business of making sure the kids will eat their vegetables. Kids will eat (and write) what is important to them. It is their time to waste. It is their choice to make. I try to help them do what is already important and interesting to them and not necessarily to me. I try not to care in a careful way. The making of art is all about being outside the box. What school is all about always is the box . LA: From articles, to short fiction, to books, you have certainly written in many different forms. Which forms are you most comfortable with? Which forms are more challenging? MM: Are you guys trying to norm me? Asking for a ranking. Is this an interesting question to you, really? What will you really learn by knowing that short stories, say, are easier than interviews-yes I think the interview form on par with stories, essays, novellas, novels, poems, etc? My favorite color is yellow. Does this help? Isn't it an interesting impulse-this urge to sort, and compare, and rank. Forms is forms to me. Colors is colors. Do I really have a favorite color? It is all about difference to me not better or worse. That might be true in an eye exam but not here. Not which is better or worse. I put my creative energy not into making judgments but into full spectrum curiosity. I'm not trying to be difficult here or snotty just that I really don't try to think in that way. I try to find something of interest in every form and not compare or rank this or that. LA: In many of your pieces, I have journeyed with you into the small towns of the Midwest and you definitely have a knack for this area of the world. Coming from a smaller town yourself, what advice can you give to aspiring writers in a similar situation? MM: The interesting word there is “knack.” Advice? Feed your knack. Listen to your knack. Welcome your knack. I am not saying that because I write about the Midwest in the way I write about it that I want you or any similar situated person to write in that way. So I guess my advice is really pretty lame in a way. Not write what you know but write what you want to write about, write what you have to write about. Tell me your knack. Over and over again. Make your knack your knack. LA: You often use your hometown of Fort Wayne, Indiana as a setting (as in The Blue Guide to Indiana). What about Fort Wayne pulls you back time and again? How has your first-hand knowledge of the town strengthened your writing? MM: Caught you! There is that word “strengthened” again. An interesting pattern is building here, yes? Do you think underlying many of the questions is the very profound idea that we as writers get “better,” can get “better.”? I have been trying to tease out (you have teased it out of me) that I don't think that way. I am not a better or stronger writer now than I was yesterday. I am a different kind of writer. I have changed but I have no way of (and no interest in) knowing if I am better or stronger. I published my first book with Alfred A. Knopf 35 years ago and my latest book with Mudluscious Books next month. Have I gotten better? Stronger? Worse? The key for me is that after 35 years I am still writing. And, I believe, that if I start thinking in terms of getting better, stronger, I will actual stop writing. Oh, I will fear, I have lost it? Am I past my prime? Etc. Why do I keep going back to Fort Wayne? Should I have moved on, moved up? No, this is what I do. I always say (when asked why I write about Fort Wayne) that someone has to and that no one has. LA: The mix of autobiography and fiction in your book, self-titled, Michael Martone, is an amazing concoction of two writing forms that you have mastered. How has your writing process changed throughout your career? MM: Yes, changed. I think the biggest change resulted from having children. Having kids changed the nature of the time/space continuum and deflected the form and manner of the way I write. I began to write when I could write. I began to think of writing as just another part of living. Writing like breathing. So what fell away was the worry about the quality of what I was making-do we worry about this breath being better than the last or the next? Writing for me became all about process and not about product. I practiced writing as a practice, a way to live and not something I did with my life. Spinning off from that is the notion that writing for me is all about the melodrama, the ground situation. I wanted to be all in all the time in the middle of things. I resist in the writing and in life the idea of an ending. Of course I know there is the big ending there, but I think Michael Martone became a book of magical thinking in its resistance to the reality of a story that insist upon a beginning middle and end. LA: In many of your pieces you use cultural parodies in order to get your point across. Where do you get your inspiration? Are there certain topics that you refuse to discuss? MM: Well, maybe wired as I am as a formalist, it is easy for me to see the artifice, the constructed nature of everything. Nothing in fact is “normal.” We live in an empirical age. Empiricism says that we know things through our senses. We put the whole pressure of knowing on these apparati-eyes, ears, memory-that are so easily fooled and manipulated. It seems the easy next step then is parody, satire of this kind of reasonable belief system. We believe as a culture in objective truth. But we “know” that our senses can be so easily fooled. And we live in this contradiction. My inspiration for this was a fun little book by Hugh Kenner called The Counterfeiters. LA: I have read that you live with your wife, Theresa Pappas and your sons, Nick and Sam. How has living with Theresa, a renowned poet, inspired your own work? I know that you and Theresa worked on a series of chapbooks together in the past-do you have any thoughts of collaborating again in the future? Check it out. He is writing about how I have used him as a character in my writing and then uses me as a character in his. And, by the way, I have liked very much collaborating with you on this bit of writing. Hope you enjoyed it too.